On Saturday I had my first taste of Wisconsin’s dessert darling, frozen custard. Imagine my surprise to discover another one of Wisconsin’s edible exports in Ottawa on the very same day: broasted chicken. Broasting is a cooking method that originated in Beloit, Wisc. in which the deep fryer meets the pressure cooker. A special machine creates pressurized hot oil (don’t try this at home!! ), which is designed to seal in the chicken’s natural juices and seal out the grease. “It’s more steam, less oil,” explains the friendly woman at the counter. 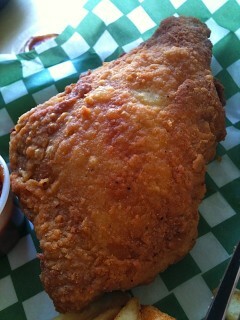 The result is crispy, golden fried chicken but without the heavy greasy coating. And, instead of dry bird, you get juicy meat that’s seems closer to poached than roasted. As far as I know there is only one place for broasted chicken (Broaster/Broasted is a trademark of the particular company that makes the machines) in Ottawa and it’s at Zaki’s, a brand-new fast-casual dining spot (a notch up from a fast-food counter in many important ways) in the Wal-Mart plaza at Clyde and Baseline. It’s run by four siblings who were born in Yemen and raised in Ethiopia, and one Afghan brother-in-law. As the “Grillmaster” he is responsible for the other half of Zaki’s broast chicken menu — beautifully marinated meats made on an open top of a volcanic rock gas fired grill, an Afghan specialty. 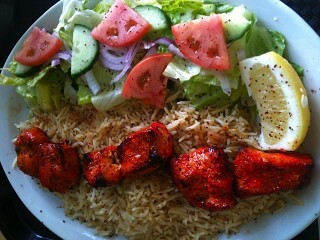 The food is all halal, in accordance with Islamic dietary laws. After placing an order at the counter for broasted and grilled chicken dishes for my family, we learned that it would be a 15-minute wait. Forget the heat lamps and microwaves, everything is made fresh-to-order — music to my ears. I also learned that all the sauces, including a super-hot green chutney, simple vinaigrette, and the naan bread are homemade. My somewhat limited exposure to Afghan cuisine has taught me that the spices are softer, subtler than Indian curries and tend to have a uniquely (and tough to describe, but I’ll try…) light, herbaceous, aromatic sweetness. Delicious. A perfect example is the Tandoori Chicken, beautiful rusty-red chunks of tender white meat with a nice char on the edges. The kebab was served with simple long-grain rice (with a flavour boost from chicken stock, perhaps), a fine Romaine lettuce salad, and whole-wheat naan that’s more firm than its Indian counterpart but golden brown and very fresh, if not ideal for wrapping around chunks of meat. After devouring a piece of the broasted chicken, enjoying the textural contrast between moist meat and thin crackly skin, and watching my daughter happily nibbling away on the crispy wing, I soon grew bored of the flavour, which registered as simply salt. But I will definitely return to Zaki’s for more examples of the seductive Afghan spice blends paired with the unique grilling technique. It’s nice to know there’s such a thing as well-balanced fast-food alternative with healthy homemade appeal for future Nepean shopping excursions. I can almost hear the sound of quivering shawarma shops across the city. Zaki Broast and Grill, Walmart Plaza, 1385 Baseline Rd, Unit 4, 613-723-1500.